The rhubarb is originally from the Himalayan region. Since the 18th century it has also established itself in the German kitchen. It is often confused with fruit, but is a type of vegetable. As spring classics, he is not only delicious but also healthy. The rhubarb season starts in April and goes up into August. 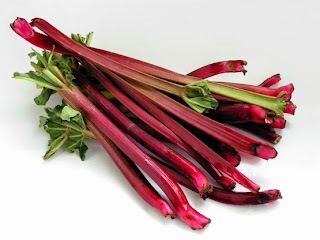 During these months, you will find in any supermarket or at the weekly fresh rhubarb. Rhubarb is low in calories and many vitamins, such as vitamin C, calcium, iron, potassium and magnesium. He also has a diuretic effect and with its phytochemicals healthy weight loss product. The fruity-sour flavor comes from fruit acids such as citric acid and oxalic acid. Experts believe - because of the high proportion of oxalic acid - can he eaten in larger amounts cause symptoms of poisoning. The acid, however, is found mainly in the leaves, so the consumption of leaves should be avoided. Who can feel a furry feeling on the teeth in the enjoyment: This is due to the oxalic acid that attacks the enamel and is deposited on the teeth. There are three different types: green rhubarb, this is across the green; the Goliath appears green inside and outside reddish; the raspberry rhubarb, which is also known as Holstein precious blood, and is completely red. As a warning should mention that it should not be eaten raw, as it has a high content of oxalic acid. The crude alcohol can bring nausea and vomiting. One should note that the oxalic acid content is low, if you buy at the beginning of the season. You simply draw the threads until mid-season, he should be peeled. Who focuses on freshness, which should pay attention when shopping, he gets crispy bars with a fresh, juicy gating. It should also have a soft red as a whole. After shopping, it is to be beaten in a damp paper and in the refrigerator, in the vegetable compartment, are kept. To process of rhubarb cake is a classic. The best places to while a yeast dough on a baking tray, cut the rhubarb small and spread it on the dough. After about 30 minutes in the oven he's done. One can vary the cake, of course, with custard topping and sprinkles or a cake glaze. For dessert, he is also a big hit. As a compote or dessert he is quick to prepare. You can prepare it with other fruits such as bananas, strawberries or raspberries. Rhubarb can be peeled quickly by removing the leaves and with thicker rods skin. The cut pieces come then in a pot and boiled with water or juice. If you want to thicken the compote that can use force. Even as a jam of rhubarb is blended with preserving sugar and boiled. You can restore it with different fruits like strawberries or mango, or as extravagant mix with ginger and coconut.